This year, we are pleased to be exploring the theme of “Eco-Sustainability” within the theme of the 8th annual Art World Expo in Vancouver. Noting all that is happening in the world environmentally and politically, it is excellent to see artists and designers being sustainable in their production of unique accessories and art work. A new-comer to Art World Expo but a past guest, we welcome Volkert Bobeldijk for Lumberjax Custom Wooden Jewelry to our annual event and showcase. Volkert has truly done something unique while thinking of nature and the ecosystem. We caught up with Volkert about his work and the upcoming event-be sure to check out his Facebook page at the end also! 1-When did you start making jewellery? I started to make jewelry about four three years ago after my wife asked me to make a ring. Her diamond clasp would get caught on the linens at the hospital where she works and a wood ring could just be worn for work. Then her colleagues and friends started asking me to make them one which helped me to move forward in my woodworking. 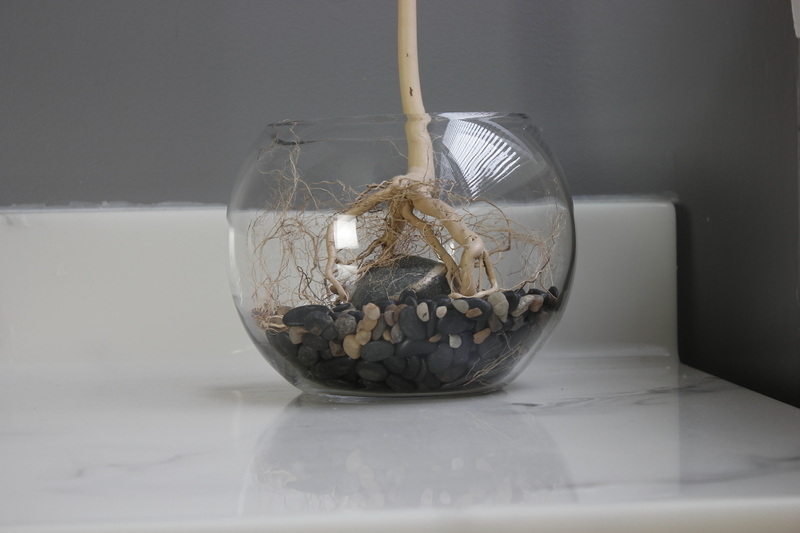 2-What inspired you to start incorporating natural elements into your designs? Being that I have been carving spoons for longer then the Jewelry making, I took to wooden jewelry quite easily. I have always had the love of wood and creating with wood my entire life but this has opened up my creative side. It also gives me the ability to use woodworking as therapy. 3-What has been the most exciting aspect of launching your own company? The most exciting part of starting my own company is the ability it has given me to spend more time with my family. I went from a high stress, long hours and away from the house type of job to working a part-time job and working my business. This gave me the pleasure of being around my children and spending the quality time with my wife. 4-How have you transformed as an artist since you began? Since I have started I have had the amazing pleasure of meeting more artisans and creative people that inspire me to grow and be who I really am. My transformation began when I saw the people who stop by my booth look in awe at the creations I have made for them. It gave me more drive to further my company and start making more products to suit all types of styles. 5-What do you aspire to do in the next five years? I wood love to see my company grow to a point of not needing to have a part-time job. This way I will be able to take care of my family full time and become more self sufficient. To work my passion and spend the upmost quality time with family and friends is my goal that I will achieve. 6-What kinds (if any) specials or promotions will you have at Art World Expo 2018? At this art show I will be giving Wooden keychains designed to put essential oils on to each client that purchases from my table. In addition, I may come up with a draw to win a wooden earrings and necklace/pendant set. To learn more about Lumberjax, visit their Facebook Page. About: Graham McKenzie is an easy-going and honest person who draws his artistic inspiration from nature. Most of his work is based off of hikes in the Fraser Valley, so British Columbians can visit the scene of Graham’s paintings! He finds joy in escaping the man-made world and immersing himself in the magical, sporadic qualities of the natural world. With his paintings, he invites the viewer to experience it with him. Your interest in art started with wax crayons. When did you pick one up for the first time? Is there a reason why you loved it so much? Art left your life for a while. Do you know why that happened, and what inspired you to get back into it? I don`t think I lost interest in art, it just faded away for a while. I started having dreams which rekindled it, and soon started to push a pencil around. How did working with your drafting board help you develop as an artist? An artist, no matter what their skill level is, needs a work place; a place where you can return to your work and not have to clear up because it’s dinner or bed time. I really believe that practice makes you better. The more you paint, draw, or scribble, the faster your fingers and brain learn to communicate. I feel that my paintings have evolved over the last couple of years because I’ve made an effort to make painting more than just a hobby. I have always been a detail-oriented person and have been working creating more depth in my work. 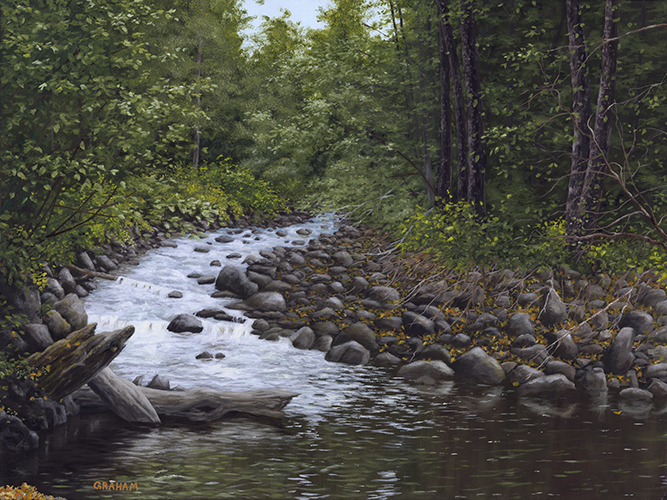 Your desire to paint nature and landscapes started after you began to hike in the Fraser Valley. What is it about this place that inspires you? Even as a child, I spent a lot of time in the woods playing and making forts. Walking into the forest really excites me! I love the green of B.C.. The way the moss grows and hangs from the trees creates a magical wonderland. What are some of your other favourite places to paint? 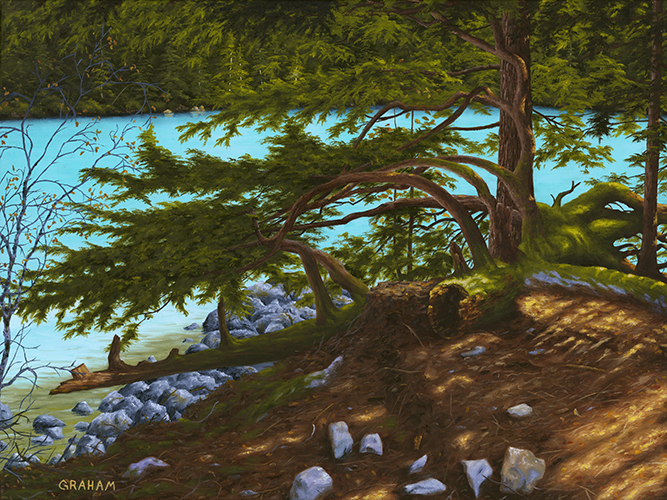 I don`t know if I have a favourite place to paint but I really like the Cultus Lake area and Lindeman Lake as well. Why do you love to paint nature, rather than anything else? I work in the aerospace industry, where everything is measured down to the one-hundred thousandth of an inch. Everything is very controlled. Now, with nature, everything is beautifully random and free. It`s that freedom that allows a person’s mind to wander, paint a branch or throw some leaves here and there to suit your mind’s eye. What does creating art do for you? Sometimes, when painting, you get into this zone where things are flowing. It`s almost like meditation. You’re thinking about what you’re painting, your day, the people in your life, listening to music, or sometimes all of them at once. It sounds busy and crowded but your mind just wanders. Then you look up at the clock and 3-4 hours have flown by. How would you like to challenge yourself in the future? I feel like I`m just getting started in my painting career, so I definitely want to put more effort in and be more disciplined. Large canvases are intimidating, so I think I have to tackle some of those as well. I’ve been fortunate in that I have met a lot of helpful and unselfish people over the last couple of years who’ve been very supportive. I want to continue to support others that I meet and pay it forward, as they say. B.C. has a great artistic community and I’m grateful that I’m starting to mix in. About: I’ve lived my life on small acreage in Abbotsford. B.C. I spent the first five years of my working life in reforestation, where a handful of friends and myself did tree planting and juvenile spacing. We would often take all our gear and supplies with us and make our own camp with plastic and tarps, and not come out for a week or so – a somewhat appealing thing to do, especially in a person’s youth – spending time in the mountains and helping in the regeneration of the forest. Juvenile spacing in reforestation is where an established plantation of either planted or naturally seeded trees are too crowded, so the density is thinned to a tree every eight or ten feet. Even though we had moved from our rudimentary camps to staying in logging camps and motels, the often inclement weather, and not uncommon assaults from mosquitos, no-see-ums, and black flies, and the isolation, all begins to wear on a person, so I decided to go farming and have been doing that since. I use to keep livestock, but quit doing that in 2004, when I started a new endeavour in trying to grow European truffles. I’ve had some successes – in 2013 I harvested the first verified Perigord truffles grown in Canada, buy I haven’t yet produced enough to say the venture has been a success. Shortly after I started the truffles was when I started thinking about growing trees for artwork. A recent change in my life came two years ago when I got diagnosed with cancer. Even though I had always been health conscious, after the diagnosis my wife Kathi and I went on a vegan diet – something we are both enjoying. It’s not an uncommon paradox that something that isn’t good can lead to something good. Your work is centralized around trees. Why did you choose to use them as a medium and what gave you the idea to use them in art? The reason I chose trees is largely because it gave me the opportunity to accomplish two things at once – give me something to grow, and provide a medium for creative purposes. It started first with the need and desire to grow something. Having grown up on a small acreage where our family always had big gardens, a person acquires a desire for growing and nurturing plants. I had a number of empty spots on my farm and was looking for a something to grow in them, so I started thinking about a few trees to fill in the spaces. About the same time, I was doing a couple of small jobs on the farm. The first was when I was picking up some cedar branches I had pruned from a tree, and the idea came to me that instead of burning them, perhaps I could find a use for them. On a whim more than anything else, I decided to try to peel them, and found them to peel quite easily, and that they were also very appealing, with their fine branching and the brightness that resulted from the bare wood. Shortly after that I was doing some weeding and I pulled a young maple tree out of the ground and noticed how substantial and interesting the roots were. That got me thinking about the roots of trees and how their size, shape and character are to a large extent unknown, even though they can be equal in mass to the part of the tree above the ground. So I wondered if roots of trees could also be peeled, intact with the top of the tree, to create art from the trees. The more I thought about it, the more ideas I came up with. So I came to the conclusion that I would grow trees in those empty spots on my farm , and use the trees as a medium for artwork. What makes working with wood different from other materials? This is my first real endeavour at creating objects of art, so I haven’t really used other materials in artwork. But having said that, there are some things about wood that can be adventitious. The first is the many ways that wood can be shaped. 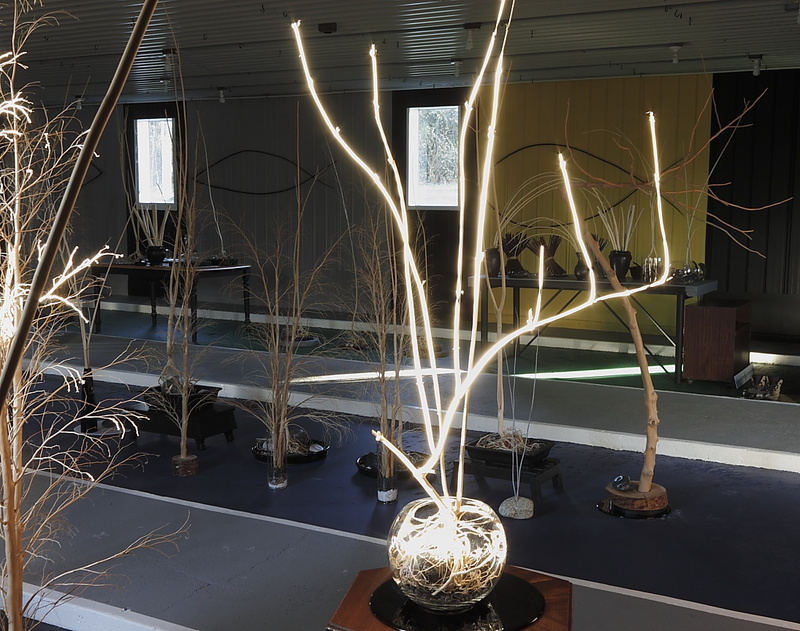 The list of the potential shaping tools for wood would be very long – from simple tools through sophisticated electric tools, fire, water, and even other organisms. And the many ways wood can be finished and transformed also offers a very wide range of possibilities – from nothing at all, through painting, staining and dyes, and yes, fire, water, and other organisms. Another potential benefit of wood can be the uniqueness and strong characteristics of an individual piece. And the relative innocuousness of wood, and often pleasing tactility aspect of wood is a bonus. Do you remember the first time you found your interest with trees or nature? I can’t remember the first instance I developed an interest with nature, but I’m sure it was at a very young age. I have many early recollections of spending a lot of time outdoors. Growing up with gardens, pastures, and bush, it would be hard not to observe, admire, and become interested in nature. As for trees specifically, as a kid I climbed many a tree – mostly just for the fun of it, or for picking some choice fruit, or even for harvesting cascara bark. I think that my work can reveal a perspective of trees that is not always appreciated. The removal of the bark is like an unveiling – highlighting and showcasing the intricacies of the tree’s wood, and with the peeled cedars, the intricacy of their fine branching. This highlighting accents the shape of the tree, revealing how the tree is always trying to reach outward and upward in it’s quest for growth. This in turn can be translated and compared to a person’s or a community’s strive for the same growth. 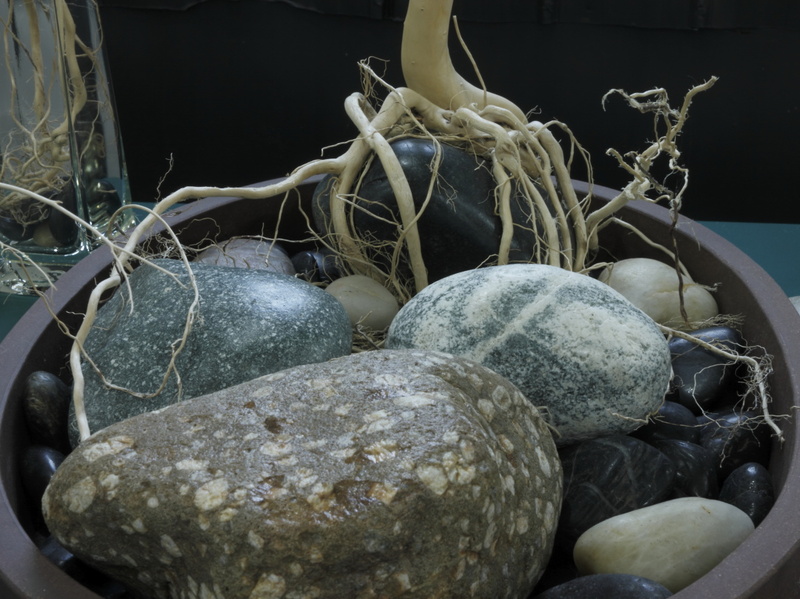 And my work with roots opens up a host of other symbolisms, such as anchoring, bonding, and nourishment. Please explain the following concepts and how you use them: ikebana, bonsai, Feng Shui and Japanese Zen. I’m far from being an expert on either of those subjects, but like with many things, there are threads of commonality running through each of those concepts – and with my work. 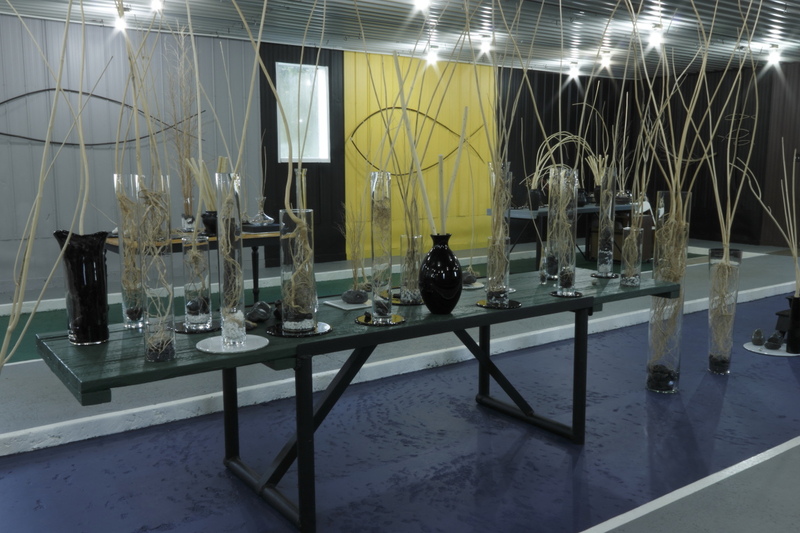 In the case of ikebana the similarities with my work are the use of different parts of a plant to draw attention to shapes and lines, the use of minimalism, and often a suggestion or evocation of a certain meaning, usually to draw humanity closer to nature. With bonsai and my work, the obvious connection is the use of trees. In bonsai the trees are kept small through judicious pruning of both the crown and the roots of the tree, and even though the end objective of my work is very different, I have to employ many of same techniques. The main artistic concept of bonsai that I try to emulate, is to reveal the essence of the tree. Feng Shui is a very complex art form that emphasizes the harmonization of people with their environment, and it is that principle that that I try to bring into my work. Japanese Zen is about balance, harmony, and relaxation, and is associated with minimalism, simplicity, and purity of lines. Although a tree in nature may strive for balance, harmony, and relaxation, the forces of nature does not always allow it to achieve that objective. And a tree certainly is not always about minimalism, simplicity, and purity of lines. When working with my trees I can choose to show the tree in either state – balanced, relaxed, simple – or the reverse – struggling and stressed out. Why do you peel wood rather than sand it and how does peeling wood impact your works? The peeling allows a lot of character and detail to remain on the wood, and if I get the timing of the peeling right, the resulting surface of the wood is very smooth with a natural sheen. The peeling also avoids some of the dust that comes with sanding, though the peeling can also be kind of messy. The fine branching of the cedars I peel could not be retained with sanding – it would be impossible to sand off the bark and still have any wood left. Have you done any works with the bark on, sanded, etc.? Would you consider it? I do have a few pieces with the bark on, but I find the pieces with the bark on to be very uninspiring, so I avoid them. If I have a piece of wood that is proving to be too difficult to remove the bark, it may end up in the scrap pile. Sometimes I will paint pieces that I purposely left the bark on. With regard to sanding, I do sand a little – to remove any bits of bark that may remain, or remove any other marks on the piece, and working with the roots requires quite a bit more cleanup and sanding to remove bits of bark and loose frayed wood. What are the themes in your art? The themes in my work is to show how a tree can be seen as a representation of energy, enthusiasm, perseverance, and be solidly grounded and anchored. How do you use sculpturing? In my work sculpturing consists of shaping the trees when they are growing and in preparation of a final piece. The most obvious and most expected place this is seen is how I shape the tree with pruning and then again the final shaping, but there can be some other sculpting going on – such as both unintentional and intentional injuries that have been inflicted on the tree – potentially adding significant character. Another area of my work where I have without doubt shaped the tree, is the roots – you just know that somebody had to persuade the roots to grow in that shape. That is the most unexpected and unique characteristic of my work. I am considering doing some more traditional sculpting of some of my pieces and I’m watching for a piece that might fit some of my ideas. You’ve said that you use representations of the trees as human characteristics. How do you use personification in your work? It is actually quite easy to use trees as the embodiment of the human form – a pair of outstretched limbs on a tree or outstretched arms on a person aren’t so dissimilar. And the human spirit can also been in a tree that is in a shape that exhibits it’s vibrant growth and outstretching, or conversely a tree that is struggling under harsh conditions can be compared to person in similar circumstances. What do you mean when you use the term “movement” in a piece? The term isn’t that much different from personification, but of course it’s not only humans that have movement. Some of my pieces that have a twist and/or turn in them elicit the sensation that it has been stopped mid-frame and could move at any time, and of course the tree did have to move to get into that position – ever so slowly as it was. And some pieces elicit the idea of a leaf or flower bud that could spring open at any time. I don’t have a favourite piece, but I’m really liking the new work I’m doing with some of my trees that have matured into trunks and roots of a substantial size. I like them for the reason that their finished size can be minimized and they still have a lot of presence. One of them is the one I’m bringing for the silent auction. I’ve named it “Schoolmarm Bole”. The “Bole” part of the name comes from the use of the word ‘bole’, in forestry to refer to the trunk of a tree. The “Schoolmarm” part of the name comes from the word ‘schoolmarm’, which is a old term to describe a woman teacher that is regarded as prim, strict, and brisk in manner and the term is also used to refer to trees that have a trunk that forks into two sections that are usually very close together – like the legs of prudish old spinster schoolmarm. Kind of mean and kind of funny. Come to the show see that it is a very appropriate name for the piece. Do they range in size? Yes, I have pieces that are very small and some that are very large. And like I mentioned earlier, with some of my older trees reaching a larger size, I’m finding that the finished pieces not only look better when they are reduced to a smaller size, but they are also more functional for fitting into most settings. My inspiration mainly just comes from my surroundings and observing and contemplating how different elements and shapes are found in nature, and how I could bring them together in such a way that they are appealing and brings a person into a contemplative state. I’ve also had some inspiration from Rodney Graham’s images of inverted trees and I’ve been watching for some pieces that I could use for some ideas I have, and have my eye on a few pieces. I might even be able to have one or two finished for the show. At first most of the tree material I used was found on my farm and I still get some of it that way, but now I grow most of my materials expressly for the purpose of using it in artwork. A lot of the rocks that I use I gathered several years ago from the Fraser River’s Herrling Island when the river was being dredged of some of the rocks to keep the channels flowing more freely. It was a great spot for a wide selection of rocks. It happens that Herrling Island – which is just downriver from Hope – is one of areas we planted – with cottonwood trees – so different in a number of ways than the usual planting that is done in reforestation. Now I get rocks from the local gravel pits, where the rocks originated from the same mountains that the river rock came from, except they were deposited by either the river when it had a different course or were deposited by the glaciers in the last ice age. I also have a wide selection of used equipment and parts from some of my former farming, that I sometimes can incorporate into my work. Of those woods, the peeled cedar is the only coniferous, so it is dramatically different than the others – mainly because coniferous trees with scale like leaves have a very fine and multi-branching top. Although they are a lot work and it is kind of difficult to remove all the bark, the end result can be very vibrant. I have tried to use the roots of cedars in some of my work, but have not had a lot of success. The peeled hazelnut’s difference is mainly that it is usually older wood from cultured trees and have a lot of character from the many pruning and natural wounds it has endured. The maple is the wood that I enjoy and have the most success with. It has the a fairly hard wood, grows fairly rapidly, and most important, it”s roots are very good for my work. Some of the other species that I use are elderberry, birch, alder, cottonwood and several other species. The one thing they all have in common is that they are all what I call volunteers – meaning I never intentionally seed them. I have enough trees on my property that if I leave a pot out with some soil in it, or there is some bare soil, nature will soon plant a tree seed for me. Although I do grow some of these volunteers, most of them have some disadvantages, such as a root system that isn’t conducive to my work, or the wood is too soft to remain in good shape during the peeling. How has living in B.C. affected your artwork? Living in B.C., with it’s mainly rain forest climate, certainly has affected my work, mainly because there is such an abundance of trees. There is no shortage of tree forms to look at, especially in the winter when the deciduous trees have shed their leaves to reveal a closer view of their shape. B.C. also provides the opportunity to work with trees in employment – which for me was reforestation. So B.C. has certainly provided a lot of exposure to trees for me. And I assume that my working with the tree roots on rocks partly originated from being in the mountains and seeing trees with their roots partially exposed. Just the overall wildness and varied nature of B.C. can be inspiring. How about living on a farm? Living on a farm keeps me close to nature, especially because I allow part of the farm to remain wild. This is where a person can get inspiration for my kind of work. It was while I was living on the farm and I was looking for something to grow that I considered my artwork. Although we are not usually too far apart on the farm, we don’t often work right together. Does growing your own crops make a difference? In regards to the material that I grow for my artwork, I wouldn’t want somebody to grow it for me – I like the satisfaction of knowing that it is all my own creation. And even though the growing of the trees can be a lot of work, I like that it keeps me outside where I can observe and experience the changing seasons and weather. Why do you prefer to stick to natural ways of growing your crops? I prefer to avoid using the often harsh and poisonous fertilizers and chemicals that can be used in farming. They can provide some savings in time and get quicker results, but also can disrupt the natural balance and diversity. I’ve made part of my barn into a showroom where I have a small collection of about a hundred finished pieces. I also have some items at the White rock Museum & Archives in White Rock, The Avant Gardener in West Vancouver, and at Monika’s studio in North Vancouver. And I will soon have an online store on my website.